Students of Saint Augustine’s School, 1915-1920. 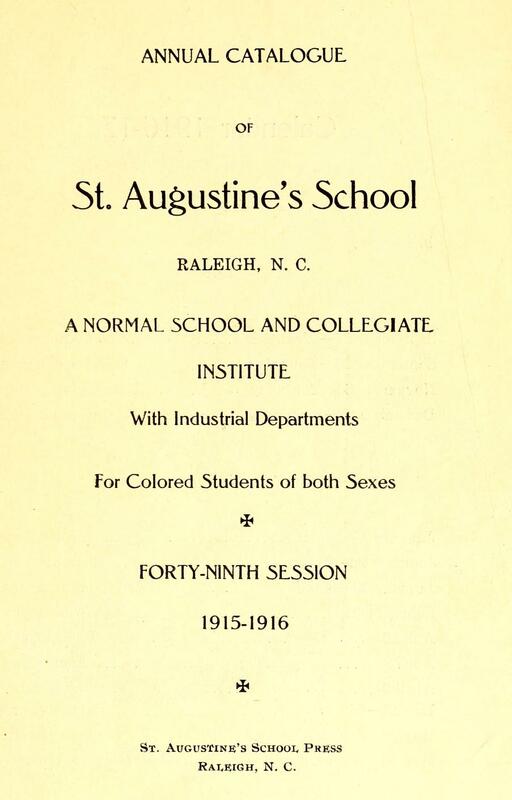 Founded in 1867 as Saint Augustine’s Normal School by Episcopal clergy to educate freed slaves, this historically black institution institution changed its name to Saint Augustine’s School in 1893 and then to Saint Augustine’s Junior College in 1919 when it began offering college-level coursework. It began offering coursework leading to a four-year degree in 1927 and changed its name to Saint Augustine’s College one year later. 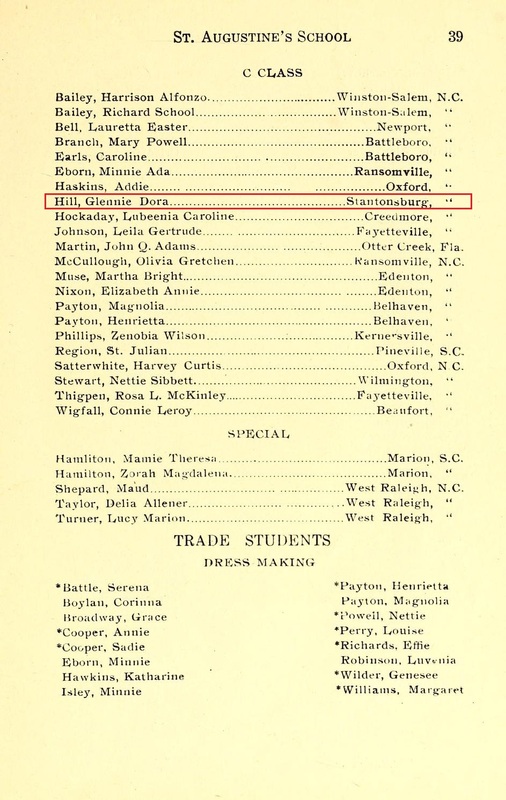 The first baccalaureate degrees were awarded in 1931. 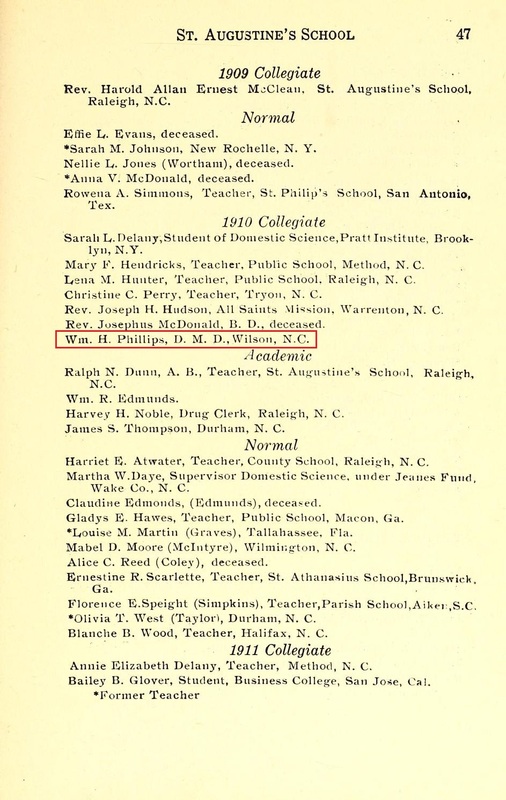 The following pages featuring the names of Wilson students and alumni were culled from Saint Aug catalogues published between 1915 and 1920. Flora Ruth Mingo Clark (1898-1985) was the daughter of John H. and Ida Crenshaw Clark. (The family resided at 706 East Nash Street, a house that was only recently demolished.) 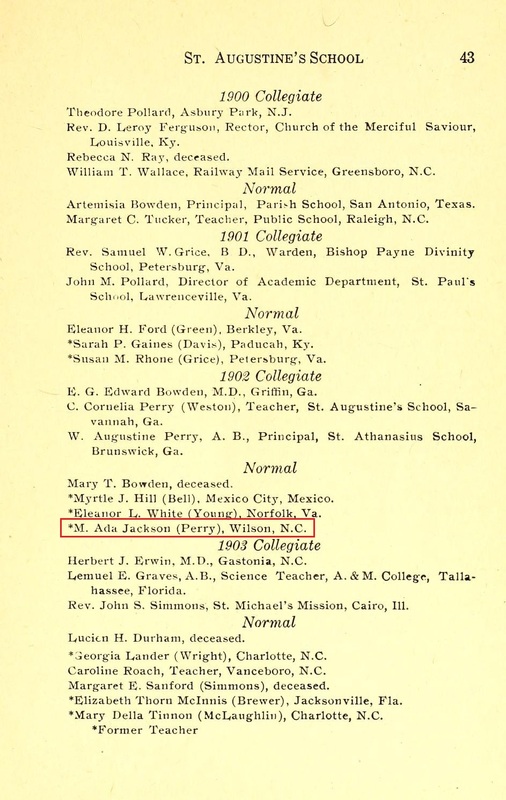 She married Wilton Maxwell Bethel on 18 June 1930 at Saint Mark’s Episcopal Church in Wilson. 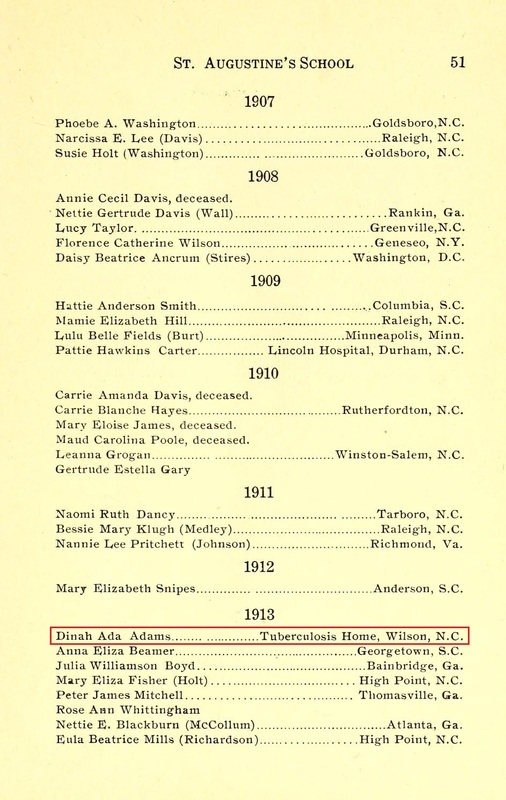 Dinah (or Diana) Ada Adams (1891-1950) was the daughter of William and Elizabeth Troup Adams of Brooks County, Georgia. 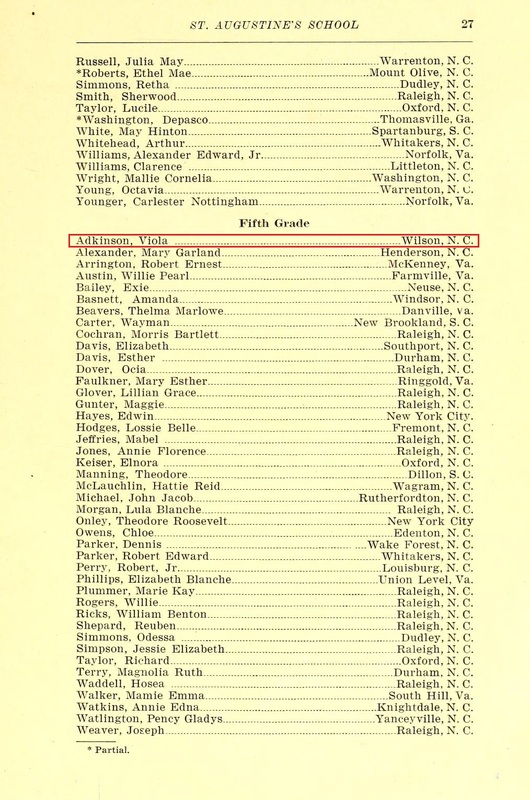 She married Wilson native Columbus E. Artis on 4 July 1918 in Washington DC. They returned to Wilson and settled at 308 Pender Street. C.E. operated an undertaker business and a filling station. They later moved to 611 East Green Street. Glennie Dora Hill (1906-1989) was the daughter of George and Mary Bynum Hill. 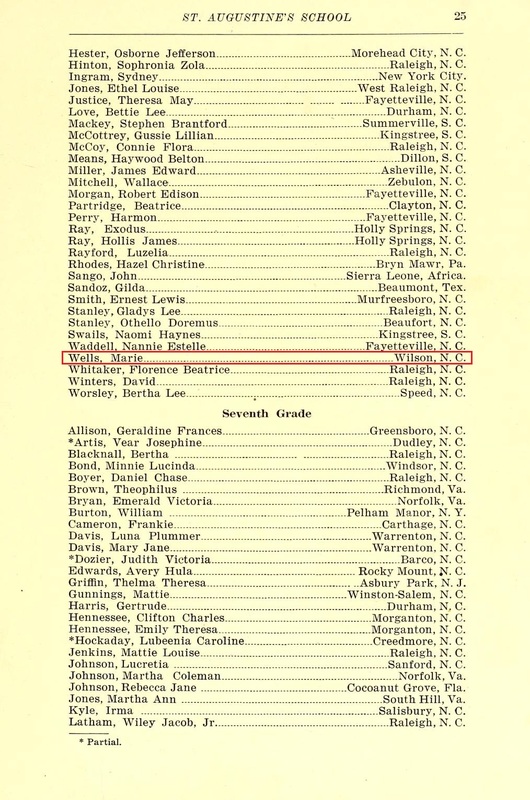 They appear in the 1910 census of Black Creek township, Wilson County, with Glennie’s siblings Lena, Emma, George and Edwin. In the 1930 census, Glennie is listed in Cross Roads township, Wilson County with husband Nathan Donald and children Eugene, Frank L., Hubert L, Alma and Algie. 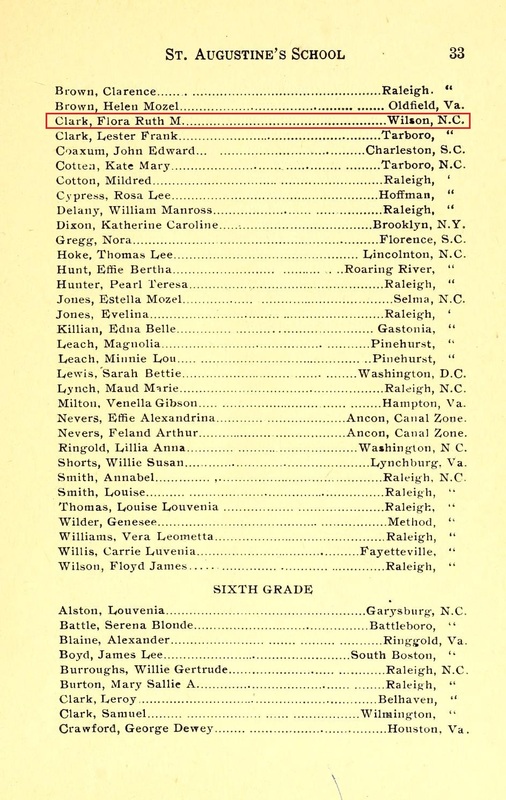 Ten years later, the family is listed in Rocky Mount, North Carolina. Glennie later was married to a Council. Raleigh native William H. Phillips (1885-1957), son of Frank and Margaret Haywood Phillips, was Wilson’s first African-American dentist. His first wife was Jewel J. Phillips and his second, Rena Maynor Carter Phillips. Phillips lived at 405 East Green Street and maintained an office at 525 East Nash. Marie Wells (1898-1997) was the daughter of Mack and Cherry Wells. The family resided at 615 Viola Street. Marie worked as a teacher and married Joseph Lucas in 1934 in Wilson. (Flora Clark Bethel’s husband W.M. Bethel was a witness to the ceremony.) They had at least three children: Joseph (1936), John Dennis (1940) and Joseph Clifton (1942). Viola P. Adkinson married Belton Parker in Wilson in 1925. They are listed in the city’s 1928 city directory at 224 Ashe Street. Belton worked as a chauffeur.